Swami Nirmalananda believed in the potency of Self rule, and he called himself the “Anarchist Swami.” He was a naturalist, a vegan and a mauni—he practiced silence for 11 years. From his solitary ashram deep in the wild forest in south India where he lived with Bambi, his deer companion, Swami Nirmalananda spread his message about peace and non-violence through letters he wrote to world leaders and followers around the world. Through his practice and his teachings, Sharon and David gained confirmation of what they had been discovering on their own—that political activism is an essential part of spiritual practice. 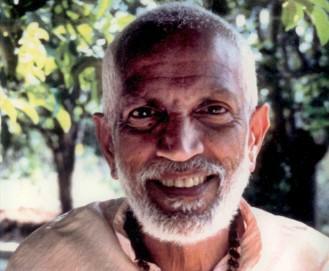 For several years, David lived as a sannyas (renunciate) after having been initiated by Swami Nirmalananda in 1989 and given the name Swami Bodhananada. Swami Nirmalananda taught Sharon and David the core mantra of Jivamukti Yoga: lokah samastah sukhino bhavantu, which Sharon interprets as: May all beings, everywhere, be happy and free, and may the thoughts, words and actions of my own life contribute to that happiness and to that freedom for all.